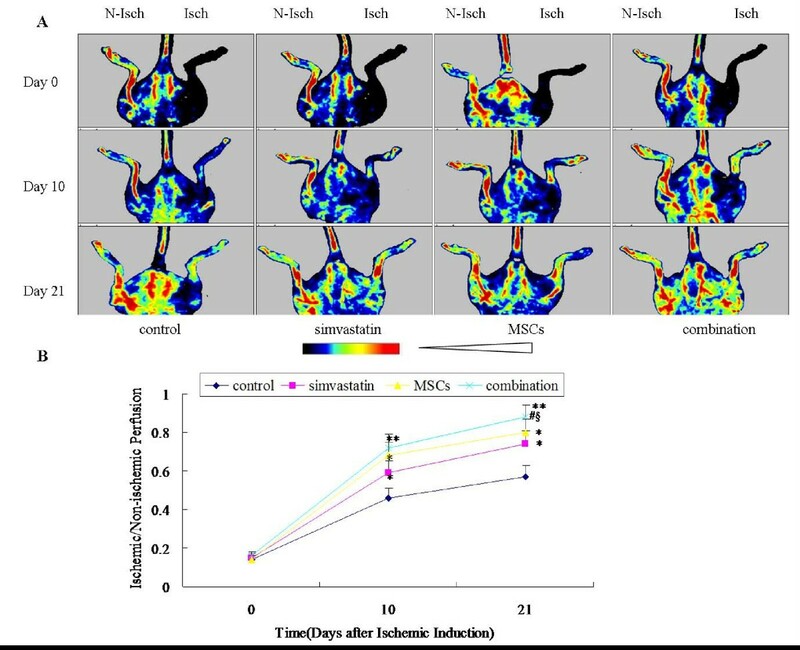 We postulated that combining high-dose simvastatin with bone marrow derived-mesenchymal stem cells (MSCs) delivery may give better prognosis in a mouse hindlimb ischemia model. Mouse hindlimb ischemia model was established by ligating the right femoral artery. Animals were grouped (n = 10) to receive local injection of saline without cells (control and simvastatin groups) or with 5 × 106 MSCs (MSCs group).Animals received either simvastatin (20 mg/kg/d, simvastatin and combination groups) or saline(control and MSCs group) gavages for continual 21 days. The blood flow was assessed by laser Doppler imaging at day 0,10 and 21 after surgery, respectively. Ischemic muscle was harvested for immunohistological assessments and for VEGF protein detection using western blot assay at 21 days post-surgery. In vitro, MSCs viability was measured by MTT and flow cytometry following culture in serum-free medium for 24 h with or without simvastatin. Release of VEGF by MSCs incubated with different doses of simvastatin was assayed using ELISA. Combined treatment with simvastatin and MSCs induced a significant improvement in blood reperfusion, a notable increase in capillary density, a highest level of VEGF protein and a significant decrease in muscle cell apoptosis compared with other groups. In vitro, simvastatin inhibited MSCs apoptosis and increased VEGF release by MSCs. Combination therapy with high-dose simvastatin and bone marrow-derived MSCs would augment functional neovascularization in a mouse model of hindlimb ischemia. Peripheral arterial disease (PAD) is one of the most common clinical manifestations of atherosclerosis, which affects a significant number of individuals. It represents an important cause of disability and is associated with elevated cardiovascular morbidity and mortality. Treatment of PAD includes anticoagulants and antiplatelet drugs, percutaneous transluminal angioplasty, and bypass surgery. However, the prognosis for patients with PAD still remains poor, and amputation of the lower extremities is often required . Several types of stem cells have been used for therapeutic neovascularization, including the bone marrow-derived mesenchymal stem cells (MSCs), which have attracted a great attention from investigators because of their plasticity and availability. These cells mediate their therapeutic effects by homing to and integrating into injured tissues, differentiating into endothelial cells, and/or producing paracrine growth factors. However, recent studies have shown that patients with PAD are often coincident with cardiovascular risk factors, such as aging, diabetes mellitus, which reduce the availability of progenitor cells and impair their function to varying degrees[4–6], likely limiting the efficiency of stem cell therapy. Therefore, optimization of strategies to improve the therapeutic potential of cell therapy needs to be developed to augment application of this technology for patients with cardiovascular diseases. Statins are 3-hydroxy-3-methyl-glutaryl-CoA reductase inhibitors and are primarily used to lower circulating cholesterol levels. In addition, studies have revealed statin's pleiotropic effects, such as the protection of endothelial function, increased nitric oxide bioavailability, antioxidant effects, anti-inflammatory reaction, and stabilization of atherosclerotic plaques[7, 8]. Recent studies have demonstrated that statins could protect against ischemic injury of the heart and stimulate angiogenesis in ischemic limbs of normocholesterolemic animals . However, both in vitro and in vivo studies have suggested a biphasic and dose-dependent effect of statins on angiogenesis . Yang demonstrated that low-dose simvastatin could enhance the therapeutic effects of bone marrow cells in pig's acute myocardial infarction model . Whereas, some studies indicated that high-dose statins could also enhance angiogenesis in vivo . Accordingly, we investigated whether the combination therapy with high-dose simvastatin administration and MSCs transplantation could augment functional neovascularization in a mouse model of hind limb ischemia. Rat MSCs were isolated with a modified procedure as described previously . In brief, Sprague-Dawley rats were sacrificed by cervical dislocation. Femora and tibia were aseptically harvested. Whole marrow cells were obtained by flushing the bone marrow cavity with low glucose Dulbecco's Modified Eagle's Medium (L-DMEM, Hyclone, USA). Cells were centrifuged at 1000 × g for 5 minutes and the supernatant was removed. The cell pellet was then re-suspended with L-DMEM supplemented with 10% fetal bovine serum (FBS, Hyclone, USA), 100 U/ml penicillin (Gibco,USA), 100 U/ml streptomycin (Gibco,USA), and incubated at 37°C in a 5% CO2 atmosphere. After 24 hours, non-adherent cells in suspension were discarded and culture media was changed every three or four days thereafter. When MSCs reached 70%-80% of confluence, they were trypsinized by the addition of 0.25% trypsin-EDTA (Sigma-Aldrich, USA), and then re-plated in culture flasks. Cells between 3rd and 6th passage were utilized for experiment. Unilateral hindlimb ischemia was created in 8-week-old female C57BL/6J mice as described previously [15, 16]. Briefly, mice were anesthetized with pentobarbital (50 mg/kg, intraperitoneally) and the right femoral artery was dissected free along its entire length. All branches were ligated and excised. The left hindlimb was kept intact and used as the nonischemic limb. Simvastatin administration and MSCs transplantation were performed immediately after hindlimb ischemia was created. Simvastatin (20 mg/kg per day) or vehicle (saline) was administered every day by gavage for 21 days. MSCs (5 × 106 cells/50 μl per mouse) or 50 μl saline was injected into the ischemic thigh muscle with a 26-gauge needle at five different points. This protocol resulted in the creation of four groups (n = 10/group): (1) vehicle administration plus saline injection (control group), (2) simvastatin administration plus saline injection (simvastatin group), (3) vehicle administration plus MSCs transplantation (MSCs group), (4) simvastatin administration plus MSCs transplantation (combination group). Simvastatin was kindly donated by Merck & Co., Inc., USA. MSCs were labeled with 1,1'-dioctadecyl-3,3,3'3'-testramethylindo-carbocyanine perchlorate (DiI) before transplantation as described previously. Briefly, 2 μg/ml DiI was added to cells suspension and incubated at 37°C for 5 minutes, then at 4°C for 15 minutes with occasional mixing. MSCs labeled with DiI were washed 3 times with PBS and then collected. The ratio of ischemic/normal hindlimb blood flow was measured using laser Doppler blood perfusion imager (PeriScan PIM 3, Swenden) as described previously[15, 16].Low to no flow was displayed as dark blue, whereas high blood flow was displayed as red to white. Previous study has demonstrated  that hindlimb blood flow was progressively augmented over the course of 14 days, ultimately reaching a plateau between 21 and 28 days in mouse hindlimb ischemia model. Therefore, at three predetermined time points (immediately after surgery, and on postoperative days 10 and 21), we performed 2 consecutive laser scanning over the same region of interest (legs and feet). The average flow of the ischemic and nonischemic legs was calculated on the basis of histograms of the colored pixels. To minimize variations due to ambient light, blood flow was expressed as the ischemic (right)/normal (left) limb flow ratio. Ischemic limb muscles were harvested at day 21 after treatment and embedded in optimal cutting temperature compound. Frozen tissue sections of 5 μm-thick were stained for alkaline phosphatase  to examine the capillary density. To ensure that the capillary densities were not overestimated as a consequence of myocyte atrophy or underestimated because of interstitial edema, the capillary/muscle fiber ratio was determined. The terminal deoxynucleotidy1 transferase-mediated dUTP nick end-labeling (TUNEL) assay was performed to determine apoptotic activity in hindlimb ischemic tissues using an In Situ Cell Death Detection Kit (Roche, Germany) according to the manufacturer's instructions. Cells in which the nucleus was stained brown were defined as TUNEL-positive and the percentage of apoptotic cells per total number of cells was determined by two independent blinded investigators. Lysates from hind limb muscle tissue homogenates harvested at day 21 post-surgery were used for Western blot analysis as described previously.Protein was analyzed using 10% sodium dodecyl sulphate-polyacrylamide gel electrophoresis (SDS-PAGE) and transferred to nitrocellulose membranes (Bio-Rad).Membranes were then incubated with primary antibodies including VEGF (1:1000, Cell Signaling) and β-actin (1:5000, Sigma) at 4°C overnight respectively.The membranes were then incubated with peroxidase labeled secondary antibody (1:1000, Santa Cruz, USA) at 37°C for 2 hours. Signals were detected by enhanced chemiluminescence (Amersham, USA). Densitometric analysis for the blots was performed with NIH image software. To examine whether simvastatin has anti-apoptotic effect on bone marrow-derived MSCs under hypoxia stress, cells viability was detected by MTT assay and flow cytometry measurement, respectively. Cells (1 × 104 cells) were cultured in serum-free medium for 24 h with 0.01 μmol/L of simvastatin, 0.01 μmol/L of simvastatin plus 50 n M of wortmannin (phosphatidylinositol 3-kinase, PI3-K, inhibitor), or blank control. Cell viability was evaluated using the MTT assay (MTT, Sigma) and flow cytometry (Becton Dickinson) according to the manufacturer's instructions. To examine whether simvastatin enhance the release of VEGF by bone marrow-derived MSCs, a total of 1 × 104 MSCs were plated in serum-free medium with different doses of simvastatin (0, 0.001, 0.01, 0.1 and 1.0 μmol/L) on 48-well plates. VEGF levels in conditioned medium were measured with VEGF ELISA kits (R&D Systems) 24 h after treatment. All values were expressed as mean ± SD. Student's unpaired t test was used to compare differences between every two groups. Comparisons of parameters among three or four groups were made by one-way ANOVA, followed by Scheffe' multiple comparison test. Comparisons of the time course of the LDPI index were made by 2-way ANOVA for repeated measures, followed by Scheffe' multiple comparison tests. A probability value < 0.05 was considered statistically significant. During the primary cell culture, the attached cells stretched and took the shape of a typical spindle-shaped fibroblast phenotype. These adherent cells could be readily expanded in vitro by successive cycles of trypsinization, seeding and culture every 3 days for 15 passages without visible morphologic change. Flow cytometry examination showed that these cells were negative for CD34 and CD45, but positive for CD44 and CD29 (Fig. 1). Thus, we designated these fibroblasts-like cell populations as MSCs. Characterization of bone marrow-derived MSCs. Flow cytometric analyses of bone marrow-derived MSCs. Cells were uniformly negative for CD34, CD45, and positive for CD44, and CD29. To determine whether simvastatin or MSCs treatment could stimulate the blood reperfusion in ischemic limb, mice were treated with simvastatin or MSCs or vehicle, the blood reperfusion was examined at day 0, 10 and 21 after the treatment by LDPI. LDPI showed that blood flow in the ischemic hindlimb was decreased equally in all four groups immediately after surgery. Over the subsequent 21 days, blood perfusion of the ischemic hindlimb notably improved in the treatment groups (Fig. 2A) The laser Doppler perfusion index was significantly higher in the simvastatin group, the MSCs group and the combination group than in the control group on day 10 after treatment and showed further improvement afterwards on day 21. The LDPI index was the highest in the combination group among the four groups (Fig. 2B). The normal value of LDPI index was 1.00 ± 0.03 in this study. Effect of simvastatin and bone marrow-derived MSCs administration on the blood reperfusion in ischemic limb. A. In color-coded images, normal perfusion is displayed as red, while low or absent perfusion is displayed as dark blue. Isch = Ischemic limb.N-Isch = Non-Ischemic limb. B. Quantitative evaluation of ischemic/normal leg blood perfusion ratio. Values are presented as means ± SD (n = 10). *p < 0.05 and **p < 0.01 versus control, #p < 0.05 versus simvastatin, § p < 0.05 versus MSCs. To determine whether improved limb reperfusion by the simvastatin treatment or MSCs transplantation was linked with increased angiogenesis in vivo, the capillary/muscle fiber ratio was assessed in the ischemic muscle at 3 weeks after the surgery by histochemical staining for alkaline phosphatase and image analysis (Fig. 3).The number of capillaries in each muscle fiber increased in the mice treated with either MSCs or simvastatin alone in comparison with the control group (p < 0.05). The combined administration of simvastatin and MSCs resulted in the highest capillary density (p < 0.05 vs. all other groups). Effect of simvastatin and bone marrow-derived MSCs administration on angiogenesis in ischemic limb. A. Representative microphotographs of the section of ischemic hindlimb muscles stained histochemically for alkaline phosphatase, magnification × 400. B. Quantitative analysis of capillary density in ischemic hindlimb muscles. Data are presented as mean ± SD (n = 10). * p < 0.05 and** p < 0.01 versus control. # p < 0.05 versus simvastatin. § p < 0.05 versus MSCs. To determine whether improved limb reperfusion by simvastatin and MSCs co-therapy was associated with differentiation into endothelial cells, the number of incorporated DiI-labeled MSCs (red labeling) into the mouse microvascular was detected by fluorescent staining against vWF (green labeling) (Fig. 4). Histological and quantitative analyses showed that the number of incorporated MSCs was significantly greater in the combination group relative to MSCs alone (p < 0.05). Effect of simvastatin on differentiation into endothelial cell of MSCs in ischemic limb. A. Representative microphotographs of the section of ischemic hindlimb muscles stained with DiI and immunofluorescence for vWF. Red fluorescence (DiI)-labeled MSCs were transplanted into ischemic thigh muscle and positive of vWF (white arrows indicated). B. Quantitative data for the number of DiI/vWF double-positive cells. *p < 0.05 versus MSCs. To determine whether improved limb reperfusion by the simvastatin/MSCs treatment was associated with increased ischemic muscle cells survival in vivo, the cell apoptosis was assessed in the ischemic muscle at days 21 after the treatment by TUNEL assay. Apoptosis as measured by TUNEL positive nuclei (Fig. 5) was significantly decreased in ischemic muscle of simvastatin and MSCs treated mice versus vehicle-treated mice. The co-treatment of simvastatin and MSCs resulted in a further decrease of cell apoptosis. Effect of simvastatin and bone marrow-derived MSCs on the muscle cells apoptosis in ischemic limb. A. Representative microphotographs of the section of ischemic hindlimb muscles stained immunochemically for TUNEL (brown yellow), magnification × 400. B. Quantitative analysis of apoptosis cells in ischemic hindlimb muscles. Data are presented as mean ± SD (n = 10). * p < 0.05 and ** p < 0.01 versus control. #p < 0.05 versus simvastatin, § p < 0.05 versus MSCs. To examine whether high-dose simvastatin and MSCs co-therapy improved postischemic neovascularization, the expression of VEGF protein was detected by western blot assay. As can be seen in figure 6, the expression of VEGF significantly increased in the simvastatin group than in the control group (p < 0.05). Moreover, the expression of VEGF was higher in MSCs group compared with that in the simvastatin group, but was lower than that in the combination group (p < 0.05). Effect of simvastatin and bone marrow-derived MSCs on the expression of VEGF in ischemic limb. The levels of VEGF in ischemic limb 21 days after surgery is measured by Western blot. β-actin was used as an invariant control. *p < 0.05 and **p < 0.01 versus control. #p < 0.05 versus simvastatin. &p < 0.05 versus MSCs. In vitro, serum starvation induced bone marrow-derived MSCs apoptosis, as indicated by flow cytometry and MTT assay. When incubated with 0.01 μmol/L of simvastatin, the percentage of apoptotic cells decreased and the viability was visibly upregulated. However, pretreatment with 50 n M wortmannin, a PI3-K inhibitor, diminished the anti-apoptotic effect of simvastatin (Fig. 7). The cell viability detected by MTT assay was significantly higher in simvastatin treated group than that in the control group. 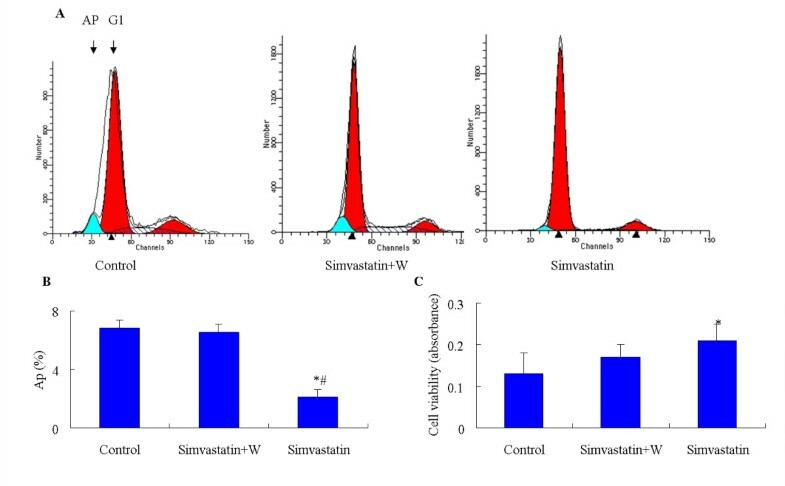 Although the cell viabilities were higher in simvastatin + wortmannin group than those in the control group, there was no significant difference between the two groups. These results indicated that PI3-K pathway was of importance for the anti-apoptotic role of simvastatin. Effect of simvastatin on the serum-free induced cell viability of bone marrow -derived MSCs in vitro. Cells were incubated with vehicle or simvastatin plus wortmannin (W), a PI3-K inhibitor, or simvastatin alone for 24 h prior to viability assessment. Wortmannin was added 0.5 h prior to simvastatin. A. Histographic representation of nuclear DNA contents measured by flow cytometry. AP = Apoptotic cells. B. The percentage of apoptotic MSCs analyzed by flow cytometry. C. Cell viability analyzed by MTT. Means ± SD. n = 6 wells per group. The data are representative of 3 individual experiments. * p < 0.05 versus control group. # p < 0.05 versus simvastatin + W group. To assess whether simvastatin affected the release of VEGF by MSCs, cells were cultured in the absence or presence of various concentration of simvastatin for 24 h and VEGF levels were measured in the conditioned medium using ELISA. Results found that VEGF levels were increased significantly in simvastatin-treated MSC cultures with a maximal effect at 0.01 μmol/L (78.1 ± 5.4 pg/ml) compared to control cultures (38.6 ± 2.2 pg/ml, p < 0.05). The VEGF levels were reduced in 0.1 and 1.0 μmol/L simvastatin-treated MSCs cultures when compared with 0.01 μmol/L simvastatin-treated cultures (Fig. 8). Effect of simvastatin on the release of VEGF by bone marrow-derived MSCs in vitro. MSCs were exposed to increasing doses of simvastatin for 24 h. Then, 24 h after replacement of the culture medium, VEGF concentration was measured by ELISA. Means ± SD of measurements from one experiment (n = 4). * p < 0.05 versus untreated controls. The present study was designed to examine whether high-dose simvastatin could enhance the therapeutic effects of bone marrow-derived stem cells in the treatment of ischemic hindlimb. Overall, this study demonstrates more pronounced angiogenic response, decreased muscle cell apoptosis and improved blood reperfusion of ischemic muscle following combined therapy of high-dose simvastatin and bone marrow-derived MSCs. Bone marrow-derived MSCs have been identified as a potential new therapeutic option to induce therapeutic angiogenesis. The main advantage of using bone marrow-derived MSCs in treating ischemic disease is that they can be isolated from bone marrow by aspiration and expanded ex vivo before implantation. Under specialized culture conditions, bone marrow-derived MSCs have the capacity to differentiate into cells such as bone, cartilage, adipocytes and endothelial cells [5, 20, 21]. These results suggest that bone marrow-derived MSCs may be good candidates for cell transplantation. However, some patients are refractory to this cell therapy. Patients with PAD often accompany with several cardiovascular risk factors, such as aging, smoking, diabetes mellitus, et al, which impair the stem cell functions to varying degrees, likely limiting the efficiency of stem cell therapy. Therefore an approach to augment the angiogenic potency of bone marrow-derived MSCs transplantation is of great importance. Statins, also known as the 3-hydroxy-3-methylglutaryl coenzyme A reductase inhibitors, are the first-line agents used in hypercholesterolemia. They are also characterized by having other benefits apart from their lipid-lowering effects. Among these pleiotropic effects are the anti-apoptotic and pro-angiogenic properties of statins. It has been demonstrated that statins could protect against ischemic injury of the heart and stimulate angiogenesis in ischemic limbs of normocholesterolemic animals. In the present study, we demonstrated that combination of MSCs transplantation and high-dose simvastatin treatment provided advanced benefits on treatment for hindlimb ischemic, compared with either treatment alone. Combination treatment significantly enhanced capillary density in ischemic limbs than cell therapy alone. This may be partially due to the enhanced stem cells survival and greater differentiation rate of MSCs into vascular cells when administrated with simvastatin simultaneously. In vitro, a higher cell proliferation and decreased apoptosis under serum-free culture was demonstrated after bone marrow-derived MSCs incubated with simvastatin by MTT assay and flow cytometry measurement, respectively. An earlier study has demonstrated that ischemia and mechanical stress induce apoptosis of transplanted bone marrow cells . In this in vitro study, we revealed that simvastatin inhibited serum starvation-induced MSC apoptosis, which may partly be blocked by wortmannin, a PI3-K inhibitor, indicating that the PI-3K/Akt pathway may be an important way in the regulation of MSCs apoptosis. Enhanced expression of angiogenic growth factors in the ischemic tissue is another contributor to augment angiogenesis resulting from combinatorial treatment. It is well known [24–26] that bone marrow-derived MSCs could paracrine several angiogenic growth factors such as VEGF, etc. On the other hand, recent studies have demonstrated that statins strongly induced angiogenesis with increases in angiogenic cytokines [27, 23]. In vitro, a higher expression of VEGF was detected in bone marrow-derived MSCs culture medium compared with blank control, indicating that MSCs could release a mount of angiogenic growth factors in hypoxic environment. Simultaneously, a highest expression of VEGF protein was detected in combination group in vivo. However, the release of VEGF by MSCs was reduced when the concentration of simvastatin increased in vitro. This indicated that the simvastatin has a biphasic dose-dependent effect on angiogenesis in vitro. Weis et al previously demonstrated that statins have proangiogenic effects at low therapeutic concentrations (0.5 mg/kg/d of cerivastatin) but angiostatic effects at high concentrations (2.5 mg/kg/d) in apolipoprotein E-deficient hypercholesterolemic C57BL/6J mice. In the present study, simvastatin augmented angiogenesis in response to acute ischemia at even a higher dose (20 mg/kg/d). Masataka Sata has previously demonstrated  that high-dose statins (5 mg/kg/d cerivastatin) promoted blood flow recovery in the ischemic hind limb as determined by LDPI. In a stroke model in mice, atorvastatin (10 mg/kg/d) administered subcutaneously after stroke for 14 days brought about an improvement in neurologic recovery, which was related with an increase in VEGF, VEGF receptor 2, brain-derived neurotrophic factor, and endothelial cell proliferation in the ischemic territory . A recent study revealed  that the same dose of simvastatin promoted angiogenesis in response to hypoxic conditions, but decreased angiogenesis mediated by inflammation. Therefore, it might be plausible that proangiogenic or antiangiogenic effects of statins might depend on distinct mechanisms of angiogenesis associated with inflammation, hypoxia, tissue ischemia, or cancer. Promotion of limb muscle cells survival under hypoxic circumstance might be another contributor to improved blood reperfusion of ischemic muscle following combined therapy of simvastatin and bone marrow-derived MSCs. Apoptosis is defined as a programmed cell death or cell suicide, which determines the lifespan and coordinates the removal of cells. A line of evidence has been demonstrated[30, 31]that simvastatin and bone marrow-derived MSCs both have the anti-apoptotic effects. Franke C has demonstrated  that simvastatin could upregulate the bcl-2 expression and enchance cells survival. Kortesidis and colleagues also demonstrated that bone marrow derived-MSCs express factors that support cell survival and avoid apoptosis thereby preserving cells which would otherwise be destroyed. As indicated by TUNEL assay (Fig. 5), hindlimb muscle cells underwent severe ischemic apoptosis after artery occlusion. However, the apoptosis cells in ischemic muscle regions were significantly reduced after simvastatin and bone marrow-derived MSCs combined treatment. Therefore, our study clearly demonstrated that bone marrow-derived MSCs in combination with high-dose simvastatin may be more effective or beneficial during the ischemic scenario than bone marrow-derived MSCs alone. Yong Li, Dingguo Zhang, Yuqing Zhang contributed equally to this work. YL, DZ and YZ carried out the main experiment and drafted the manuscript. FZ and DZ conceived of the study and designed the experiment. GH helped to finish animal model and finished statistical analysis. All authors read and approved the final manuscript.